In the first volume of the One-Punch Man manga, the main protagonist Saitama faces a villainous monster claiming to be the strongest being in existence. Instead of boasting, the villain ruminates about the death of his older brother and realizes that obtaining superhuman strength has cost him greatly. When Saitama jumps into frame to defeat the monster, he says, “Tell me about it. Overwhelming strength…is boring.” The strongest monster is then defeated in a single punch and is never to terrorize City Z again. Life goes on. One-Punch Man is a series that takes several cues from the hyper-masculine shōnen titles that came before it, yet is so cleverly layered it runs the risk of being dismissed as simplistic or derivative. Originally self-published as a webcomic in 2009 by ONE, the series gained enough traction and popularity to earn a manga adaptation in 2012, complete with artwork drawn by award-winning artist Yusuke Murata. One-Punch Man is one of the most popular manga titles in the United States and Canada, and this has a lot to do with its straightforward premise and familiar narrative structure. But what makes the series important is how Saitama’s ability to end a battle with a single punch has left him at the mercy of a demoralizing existential crisis. The way Saitama responds to and overcomes this problem is what truly sets One-Punch Man apart from the titles from which it cheerfully borrows. 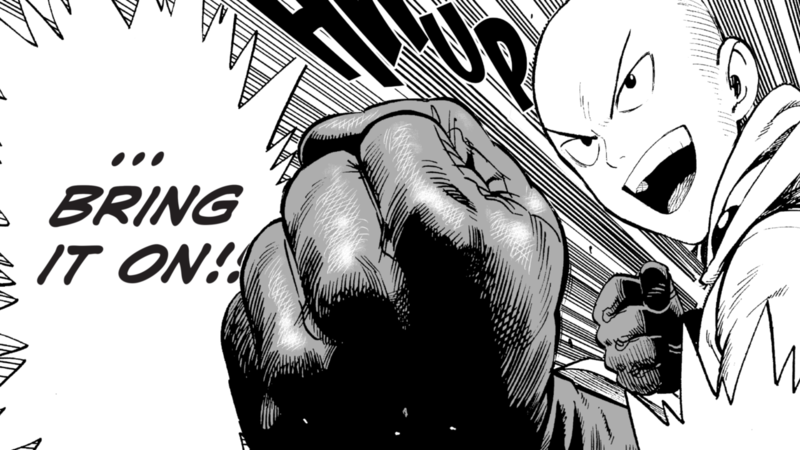 If One-Punch Man is contextualized in history, ONE is part of a new generation of storytellers and artists who grew up reading the shōnen and seinen manga that established what anime was to the Western world, titles like Akira, Dragon Ball, One Piece, and others. As part of a generation who has experienced the legacy of these titles, including their hyper-masculine and powerful male heroes, it makes sense to see ONE call into question the way heroes are formed, seen, and absorbed by readers. 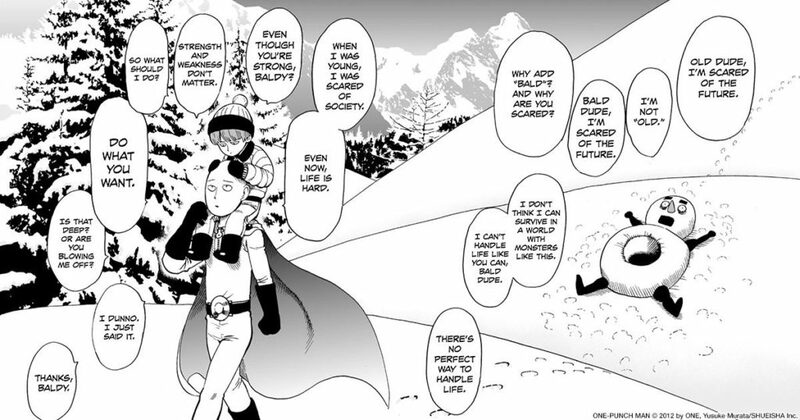 Saitama is also concerned with the kind of hero he wants to be. It turns out, having unconquerable strength has done nothing but blindside him to not only real world problems but the problems within himself: he struggles with depression and anxiety. As part of a generation who has experienced the legacy of these titles, including their hyper-masculine and powerful male heroes, it makes sense to see ONE call into question the way heroes are formed, seen, and absorbed by readers. The representations of mental illness in One-Punch Man are indeed subtle, but to someone who experiences and lives with both of these things (like myself) the clues light right up like beacons. When the manga begins Saitama has worked as a hero for three years, but without proper recognition from society he has withdrawn from everything, emerging only to go to the local grocery store to buy soup stock, noodles, and occasionally a few eggs. Saitama is a laconic person by nature, but he is disinterested in a lot of things, distraught over failure, and exhausted and annoyed by everyday conversations. One early sequence in particular reveals the ways in which Saitama’s need for strength has changed him. 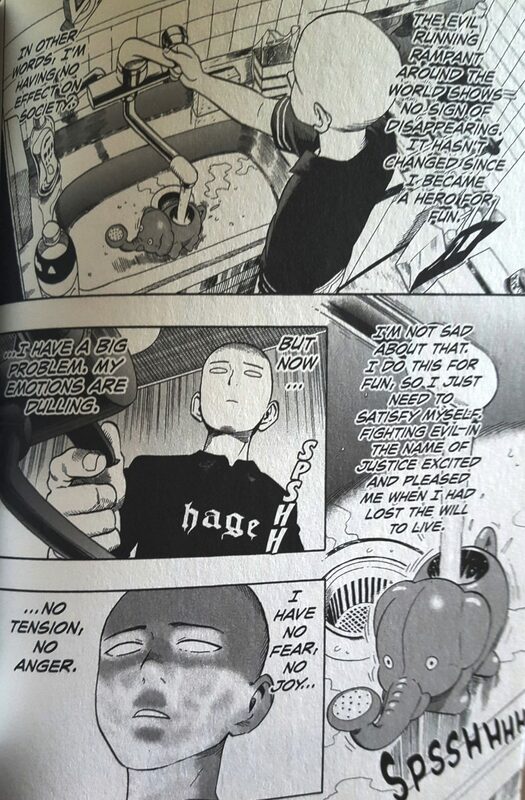 Here, Saitama ruminates about the steady disconnect from his emotions while he fills a watering can to begin his daily routine. He is drawn without pupils to convey a zombie-like trance. His watering can is decidedly odd (elephant shaped) and his shirt reads hage, which literally translates to “bald” or “baldness.” Though there are humorous elements here, they do not completely take away from the gravity of the scene. Saitama clearly states, “Fighting evil in the name of justice excited and pleased me when I had lost the will to live.” This sequence is almost a perfect representation of the complexities of anxiety and depression, especially considering the humorous elements included in the scene. It is easy to perform humor to divert attention from a mind that is constantly shrouded in self-doubt and impostor syndrome. It is common for people who have not experienced mental illness to comment on a depressed person’s behavior as unexpected or unbelievable. Depression is of course more than a simple mood or feeling; it can be incapacitating. Saitama’s daily routine is something he clings to in order to stave off feelings of uselessness. The metaphor of defeating everything in one punch and searching for the fight that will fulfill him is Saitama’s way of living with not only his shortcomings before he became a hero but also his loneliness and depression. There is no “cure all” for mental illness. Different methods work for different people, but many agree that accepting and living with mental illness is the key to maintaining it. Rather than fight it, it is a part of you. It is unchanging. It is normal. The omake also provide a unique perspective of being alone, and what that feels like…Being completely independent can be hard and it can absolutely be upsetting, but it is also essential to becoming a successful adult. One-Punch Man is culturally important when it comes to establishing loneliness and isolation as part of a heroic narrative, and thus, normal. The term mono no aware is a Japanese concept expressed in various ways across many mediums. It is popular in film, anime, and manga. The term does not have a true English language or Western equivalent, but it is roughly understood as a realization of the impermanence of things. This is not always a negative experience; it is often used to mark or reflect on significant milestones such as birth, marriage, love, or death. Japanese filmmakers Akira Kurosawa and Yasujiro Ozu were known for using mono no aware effectively within their work. Since anime and manga are also visual formats, mono no aware can be rendered through the layering of panels, backgrounds, or even the artwork itself. One-Punch Man uses this quite well throughout its narrative to add a sense of realism to Saitama’s characterization. Though the anime adaptation has reflective moments and sweeping shots of abandoned buildings, playing fields, and pastoral landscapes to evoke moments of reflection or sadness, the manga (and ONE’s original webcomic) spends more time with Saitama in everyday life. The manga adaptation renders sad, thoughtful moments in ways that feel very personal and true-to-life. This especially comes through in the omake (extra chapter) manga. Many of these bonus stories give the reader insight into Saitama’s life before he became a hero, always doubly humorous and serious. Many of these bonus manga detail his struggles with money and unhelpful peers who sneer at his determination to become the strongest man. Most importantly, the omake chapters are essential to understanding the concept of mono no aware and its connection to depression and anxiety, especially as Saitama navigates an indifferent and difficult world by himself. He finds joy in small things, like an extra long French fry or finding enough loose change to buy a new flavor of soda pop; old women pay him in bags of candy or vegetables for fending off purse snatchers, and he saves a child from being hit by a car. His small heroic acts foreshadow the type of person he will become. The omake also provide a unique perspective of being alone, and what that feels like. This is especially true when Saitama observes many other people his age struggle to occupy their time when what they want to avoid is loneliness. Being completely independent can be hard and it can absolutely be upsetting, but it is also essential to becoming a successful adult. Saitama learns to push past his initial social anxieties and the depression that keeps him stuck in a comfortable though unhelpful rut. After he saves the teenage cyborg Genos from defeat, Genos recognizes Saitama’s power and asks to become his pupil. Saitama pushes Genos away at first, not only because Genos sees how powerful he is, but because Genos could easily become his friend; relying on someone else is uncomfortable to someone who has spent so much time alone. It is endearing to see the progression of their friendship over the course of the manga, and the small details of their changing relationship (such as Genos buying Saitama’s favorite foods or cleaning his apartment) really drive home ONE’s realistic depictions of human interaction. For all of its serious moments, One-Punch Man is a satirical series at heart. It thrives on parody and facsimile while also presenting an unconventional approach to a superhero narrative. Saitama does have a smartass streak in him and that is part of what makes him so appealing. He can see right through the false sincerity of the capitalistic Hero Association; heroes being paid to save people’s lives doesn’t quite sit well with him, especially because Saitama has spent so much time as a poor single twenty-something scrutinizing himself for his lack of abilities. Since he knows what it takes to earn true power, Saitama doesn’t hesitate to point out the flaws in other heroes, especially if those heroes have made their way to the top crushing rookies or throwing money around. Saitama might not exactly be cuddly himself (he favors teasing people and is a bit selfish when it comes to his heroic deeds) but he does not take well to injustice, especially if his contemporaries are arrogant and overpaid. This is exactly why reading about Saitama’s experiences really informs what kind of hero he is. He does it for “fun” because it excites him, because it is the right thing to do, because it is the only thing that he could do. Saitama is a truly relatable character because he was crafted out of existential frustration: ONE quit a job as a salaryman to draw and write manga full-time. Similarly, Saitama could not hold down a finance job before the manga begins. This theme of leaving behind prescribed and expected goals is prevalent in all of ONE’s work. What makes his comics so timely and relatable is his characters’ resistance to societal norms and false notions of happiness. His heroes are unpopular, misunderstood, and struggle with many kinds of insecurities. ONE’s work, and Saitama by extension, is an interrogation of a culture that often praises workers who sleep in their offices to work extreme hours, but whose mental health goes greatly unexamined. It is hard to be happy or to do things “for fun.” Saitama’s trajectory as a hero proves this. When he decides to actually inspire the lives of others instead of looking out for himself, it truly becomes a moment of growth. After obtaining the most strength he possibly could, Saitama realizes it never really mattered in the first place. Physical strength is just that. He needed to nurture his mental fortitude as well as his heart’s. He’s almost lost all sense of himself until he helps a person and it reminds him why he became a hero in the first place. One of my favorite moments like this is early on in the manga in another omake, after Saitama defeats a scary snowman monster and walks home with a little boy on his shoulders. I have often turned to fiction when things are difficult, and the way Saitama speaks to this little boy worried about the future resonated with me. “I can’t live in a world with monsters like this,” the boy says. “I can’t handle them like you can.” Saitama doesn’t try to deny or sugarcoat the boy’s view of the world, accurate as it is. Monsters are real and they very well could harm him. But Saitama’s “do what you want” response is important. Though this advice is lampooned (“Is that deep? Or are you blowing me off?”), it is a simple declaration of straightforward determination. There are monsters in Saitama’s world and all of them skew from ridiculous to outright terrifying. Some of them attack for attention, some of them work for supervillains, and some just want blood. To many, these monsters are unknowable and too frightening to think about. They represent an evil that cannot be understood. To Saitama, a three-armed monster from some horrible crack in the Earth is not a challenge, least of all frightening. A monster he can understand. It attacks, he punches, and it blows apart. What is actually frightening is not having a purpose, not being able to feel anything, or worse, having a purpose and completely fail at it. Before the manga begins, Saitama has already fought so many of these monsters, real and imagined. He has seen the limits of his own inaction and loneliness. He’s chased it away with a strict workout and a daily routine, with friendships and healthy competition, with food, manga, and sarcasm. No matter how much stronger these monsters may be, they can all be defeated with a few good punches. Even if in his heart he wishes for a challenge, Saitama will still be ready for it. One-Punch Man is absolutely about being a superhero and enjoying it, but it is also about facing the challenge of adulthood and wading through adult depressions and anxieties. It is refreshing to read a superhero narrative without darkness or sacrifice, without a character pretentious enough to lord responsibility over humans. Instead, Saitama is petty and reserved but also generous and kind. He can be lazy and skeptical but committed once he’s motivated by something he truly enjoys. The subtle way that Saitama is crafted as a character with the anxieties of an everyday person pushes against the wisecracking sociopath/gritty bearded protag aesthetic popular not just for current superheroes, but for most Western media as well. Above all, ONE has written Saitama and the narrative of One-Punch Man to feel authentically like being a single twenty-something trying to figure out the politics of societal pressures, social interaction, and living with mental illness rather than trying to crush it out of ourselves. Sometimes, like Saitama, we aren’t cut out to be in sales. Sometimes we quit a good job to peruse a dream. Sometimes we’re too good at something, and it gets boring. Sometimes we aren’t good enough. Sometimes we look to the future no matter how scary it is and we live with what we’ve been through, put on our superhero costume (whatever it may look like), clench our fist, and wait for something to challenge us, even if we might fail. And that’s okay.